In 1895, Jame's grandson, John Younie Tulloch (J.Y. Tulloch) owned the Branxton General Store and accepted an unusual settlement for a debt owed to him - a 43 acre property in nearby Pokolbin. 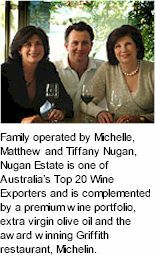 Tulloch took an immediate liking to the property and the five acres of neglected Shiraz vines it contained and undertook his first foray into viticulture and winemaking, which began the family tradition. The Murphys eventually moved to Trentham Cliffs in 1960 and re-developed one of the local properties which was once part of a large sheep station. 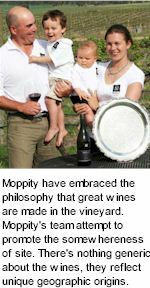 Jack and Moya Murphy established their farm, which included plantings such as citrus, vegetables and grapes for fortified wines, and then later re-planted to specialize in varietal grapes. 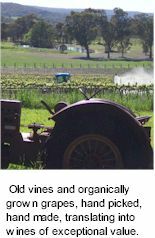 The vines flourished in the rich red loam over limestone soils, nurtured by water from the Murray River. The first vintage was produced in 1984, using only 6 tonnes of grapes. 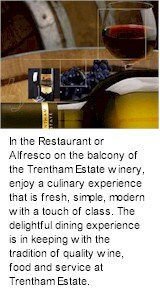 Tempus Two is proudly, home to Roche Wines, Tempus Two Wines and Hunter Valley Wine Country's premier outdoor events. Events on the estate have included sell out concerts by Sir Elton John, sell out concerts with Rod Stewart, and a night with the world's greatest guitarist, Santana. KD Lang has appeared on the main stage, as well as a spectacular performance by Matchbox Twenty and Thirsty Merc. Semillon and Sauvignon Blanc are considered a perfect match because one compliments the other, bringing all the desired flavours and complexity of a great wine together. Semillon adds the texture, body and richness to Sauvignon Blanc and Sauvignon Blanc offers the structure, raciness and backbone to Semillon. 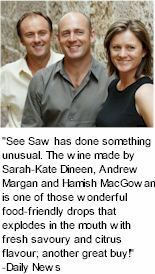 A cross-Tasman marriage of components, blended to create a wine offering the best of both worlds, makes a perfectly balanced drop with an appropriate name – See Saw. 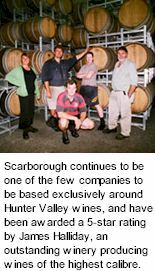 Scarborough has been producing its unique style of wines since 1987. The estate continues to be one of the few companies to be based exclusively around Hunter Valley wines, and have been awarded a 5-star rating by James Halliday for being an outstanding winery capable of producing wines of the highest calibre. 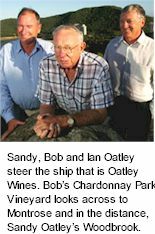 Ian Scarborough specialises in Chardonnay, from the full-flavoured Yellow Label to the light, crisp Blue Label style, this varietal has become synonymous with Scarborough! Set on a property, named Wildfell by the first landholder in 1851, the Redbox Estate's fruit is gingerly tended and harvested to produce a fine range of wines. The Shire of Nillumbik is steeped in history and dotted with villages and towns, each with its own special magic. Names like Cottle's Bridge, Panton Hill, St Andrews, Hurstbridge and Wattle Glen all hinting of a culture brought to the region by the Scottish settlers in the early 1800s. The eight acre vineyard was originally planted to Riesling, Chardonnay and Cabernet in 1986. It's proximity to Melbourne and the rolling hills broken by dense stands of Red Box and other eucalypts makes it a haven for weekend visitors and wine tasters from all over. A graduate of London’s famous St. Bartholomew’s Hospital, Henry Lindeman discovered winemaking while travelling through Europe in the late 1830s. 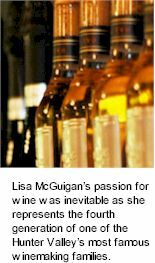 Fascinated by wine’s medicinal benefits, he devoted much of his time to learning the skilful craft. In 1840, he returned to England to marry Eliza Bramhall and within weeks, the couple embarked on a four-month voyage to start a new life in the Australian colonies. At the time of its establishment very little premium wine was drunk, there was no capital to invest, and Cabernet was an unproven grape for the area. Its name was almost a foregone conclusion and Lakes Folly was born! 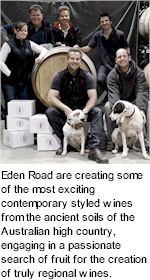 Few wineries as young or as small as Eden Road have won so many prestigious awards. Their dedication to searching for great terroir, coupled with a desire and devotion to unlocking the potential and uniqueness of local fruit. Since its very first Vintage when it won the Jimmy Watson Memorial Trophy, Long Road Shiraz has quickly become one of the most storied and eagerly sought after Shiraz wines. Part of the intrigue of Long Road Shiraz stems from the fact that it was born to express the new and exciting wine regions around the high country of NSW, as an elegant and contemporary style of Shiraz. The style has evolved since 2008, when exploring the high country of NSW predominantly involved Canberra and the Hilltops region. It has now extended to include the hidden jewel of the Gundagai region as a thriving source for Long Road Shiraz. 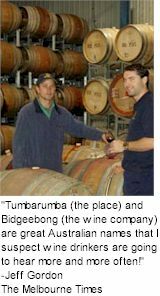 Cumulus Wines was established in 2004 when Sydney based Assetinsure acquired the extensive vineyards and state-of-the-art winery from Reynolds Wines. World renowned winemaker Philip Shaw was appointed by Assetinsure to develop the new wine company focusing on cool climate, high-altitude varieties of exceptional quality. 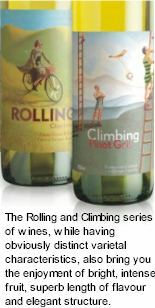 Since then, Philip has created exciting wines with innovative packaging, including extremely distinctive label designs. Grapes are sourced from a group of growers farming on the characteristic lean pink granites and reddish shale loams of the Canberra District. The wines are hand made for balance, character and depth of flavour. 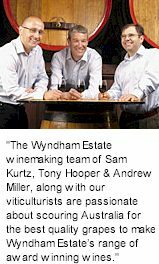 Fruit is vinified near Collector, on the southern tablelands of New South Wales. Collector Wines has been named Best New Winery in the 2009 Penguin Australian Wine Awards, and rated a 5 star winery in James Halliday's 2010 Australian Wine Companion. 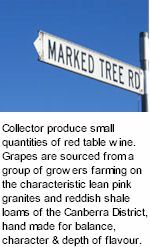 Collector Wines 2005 Marked Tree Red was awarded the NSW Wine of the Year for 2007. The 2008 Collector Reserve Shiraz was awarded four trophies including the Dr Gilbert Phillips Memorial Perpetual Trophy for Best Red Wine of Show at the 2010 Macquarie Group Sydney Royal Wine Show. Clonakilla was established in 1971 by John Kirk, a Canberra based research scientist. Of Irish descent, John came to Australia with his young family in 1968 to work with the CSIRO Division of Plant Industry. 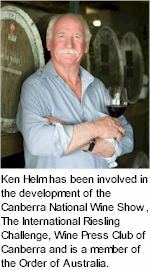 To his surprise despite the suitability of the environment there was no wine industry in the cool southern table lands of NSW around Canberra. 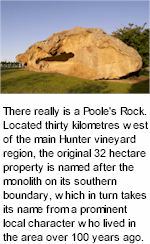 To remedy this situation, in 1971 he bought a 44 acre farm near the village of Murrumbateman in New South Wales, 40 kilometres north of Canberra. The soil consisted of sandy clay loams over a friable clay subsoil and, with a climate not dissimilar to the Bordeaux region and Northern Rhone valley in France, he held high hopes for its wine producing potential. The CSU Winery is an integral part of Australia's leading wine and food science school and as such is at the forefront of viticultural practices and wine making techniques. 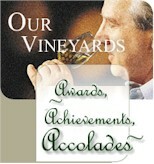 The winery focuses on excellence, using state of the art technology without sacrificing tradition. 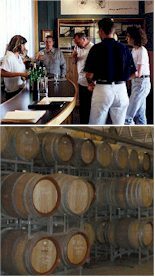 It is seen as important that the winery reflect the same environment as other commercial Australian wineries, being market driven and producing the quality and styles of wine that obtain ready acceptance from discerning wine consumers in the open market place. High on a hill overlooking the beautiful Hunter Valley. A state-of-the-art winery. An imposing bell tower. Spacious tasting rooms. Magnificent cellars. Bimbadgen Estate. Dedicated to the art of wine. Bimbadgen Estate Winery is situated two hour's drive north-west of Sydney in the picturesque Hunter Valley, Australia's oldest premium wine producing region. The Bidgeebong Triangle encompasses three distinct districts, Tumbarumba in the foothills of the Snowy Mountains, the Hilltops district centred on the town of Young, and the Murrumbidgee plain around Gundagai on the Hume Highway about half way between Sydney and Melbourne. The name Bidgeebong is a combination of Murrumbidgee and Billabong. The Murrumbidgee River is the lifeline of the region. Billabongs meaning places of still water in the Wiradjuri language, were the gathering or meeting places of the original owners of the area, the Wiradjuri tribe. The Wiradjuri occupied this land from time immemorial until Irish farmers established and named the first stations here in the 1800s. Hilltops enjoys adequate and reliable rainfall, with mild days and cool nights, allowing for the slow, even ripening of fruit. 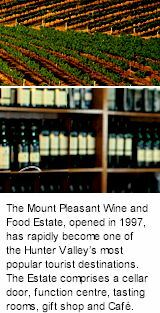 The region’s high altitude, cool prevailing winds from the Great Dividing Range which offset diurnal temperatures, and the high minerality of the soil are three significant elements which combine to make the Hilltops a distinctive wine producing region. A dry summer and autumn, with cool nights and mild days exacerbate the extended ripening period. Heavy snowfall and frost in winter are quite common; and whilst substantial rainfall occurs in the growing season, most falls in spring.